Watching: Obviously I went to see Jurassic World as soon as it came out and it was ridiculously amazing. Proper dinolicious. The setting was epic- with a vast , wide-sweeping aerial view with that infamous tune made it warmly reminiscent of the original. Even before the scary escaping dinosaurs the film was epic and I wanna go to Jurassic World and ride the triceratops. Beyond that the film was fast-paced, very realistic and the child in the seat next to me was jumping around and making excuses to escape to the toilet throughout. Now I realise why my parents wouldn't let me see the original at the cinema. I totally recommend it, and not just as an homage to Jurassic Park. Doing: visiting Butterfly World Edinburgh. My sister and family visited to celebrate my niece Arianna's 3rd birthday. We took her to Butterfly World and I have to admit that I was as fascinated by it as she was! Although maybe a bit tired, the ecosystem of creepy crawlies is certainly thriving. There were caterpillars and butterflies at every stage of their life. We even saw a butterfly coming out of its chrysalis. My niece is no scaredy-cat though, desperate to hold the snake and millipede Which, with her tiny hands, meant I had to hold them too! Buying: Although I did buy a few wee things this month while I was in London, I didn't have to because my birthday filled my wardrobe gaps! I got dream gifts like those Naomi Murrell earrings, *that* JACKet blazer and of course, Steve, the White Pepper stegasaurus! I love that little clutch, even if he is too long to fit in anything and can only fit a mobile phone inside. I'll take an extra bag/ fill my pockets just to take this little guy for a walk! 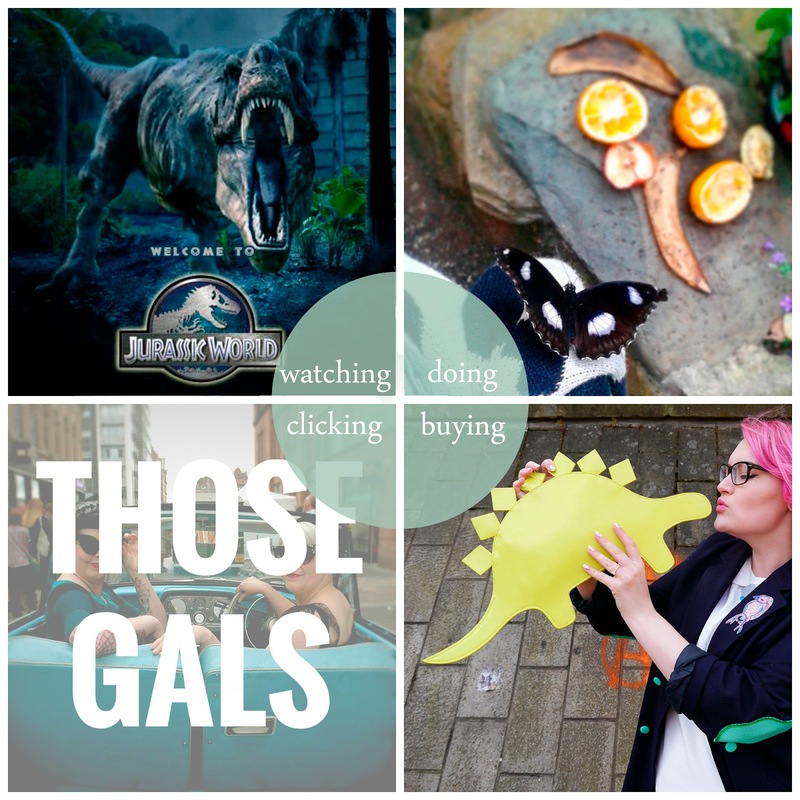 Clicking: Those Gals podcast. I'm extremely late to this party and I have no excuse since it's the brain child of my babe Miss West End Girl and her stylish dressmaking bestie Elaine. And the reason is this: I couldn't get itunes to work because I'm a technophobe. Say what?! A blogger that can barely use a mobile phone? That's what I have a Helen and a husband for. Anyway, I've been catching up on Those Gals and it is like a friendship comfort blanket. The early episodes in particular hark back to being a school kid in the 90s and those early 00s fashion faux pas. You feel like you're hanging out with them and you'll will find yourself talking to your laptop- exclaims of "ohmigod I totally did that!" "Ah, remember that!". You will also find the urge to call your besties to remind them how much you love them. Watching: With all the bus adverts, posters and teasers it's been hard to avoid Channel 4's new series, Humans. Kimberley and I watched the first episode while we were in London. I'm not sure if it was the small screen, social media distractions or just the sheer exhaustion after spending the day scouring Brick Lane but it just didn't grab me. I've since gone back and re-watched the first episode which then led me straight on to numbers 2 and 3. A bit of a slow start but I'm enjoying the subtle sci-fi and the excellent acting and looking forward to seeing how the series plays out. Doing: Degree show madness. I love degree show time. It always fills me with so much inspiration. I haven't quite managed to make it to as many as last year but I did get a look at Abertay, Duncan of Jordanstone, Edinburgh College of Art, Gray's School of Art and see a mix of photography work at the Free Range exhibition at The Old Truman Brewery. Phew! It would be impossible to pick a favourite from all the awesome work but there seemed to be a theme of strong printed textile works and plenty of bright colours, which I loved. Buying: I popped along to Crafted at the DCA. This was their summer craft and design fair and it was filled with good stuff. Some designers I'd seen before but I was also introduced to some new folk. I may have treated myself to something from Taisir Gibreel and something small from the Tom Pigeon sample sale. And a Beth Lamont necklace is now top of my wishlist. It wasn't all shopping though, there were also some fun meet the maker stalls on the go. I got to squidge Rosie Kimber crystals, screen print a tote bag and make a felt flower brooch with Syrah Jay. 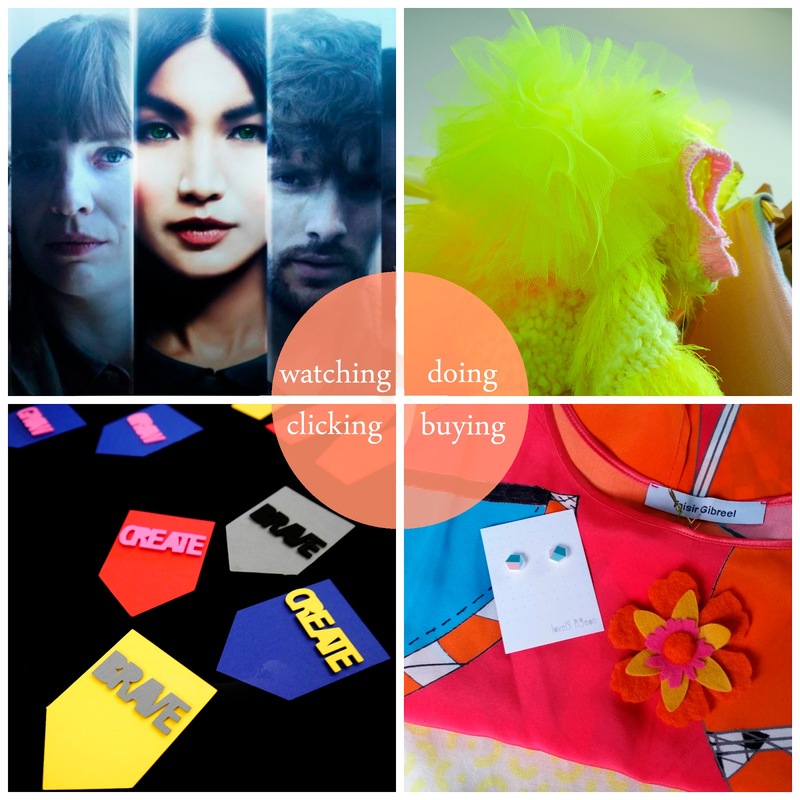 Clicking: After attending Blogtacular earlier in the month I've been enjoying reading everyone's posts about the event. With so many bloggers in attendance there's certainly been a fair few of them. It's good to see one event from so many different perspectives. And because there were so many different talks and workshops it's a great way to learn about the ones I missed. If you didn't make it along (or just want to re-live the fun) you can check out a lot of the posts on Pinterest. And while you're there, do check out our new boards.